If you’re anything like me, your writing space is your haven. It’s that place you retire to at the end of the day, where thoughts and words tangle together and give life to the things you want to share with the world. It can be inspirational to look at with beautiful books, elegant pens, freshly cut flowers and a few antiques. Or it could consist of modern clean-cut lines with minimal decor, which allows you to focus. Heck, it can even be the smallest corner where your notebook or laptop fits and you can spend a blissful (or frustrating) hour or more carving away at your latest blog post or novel. 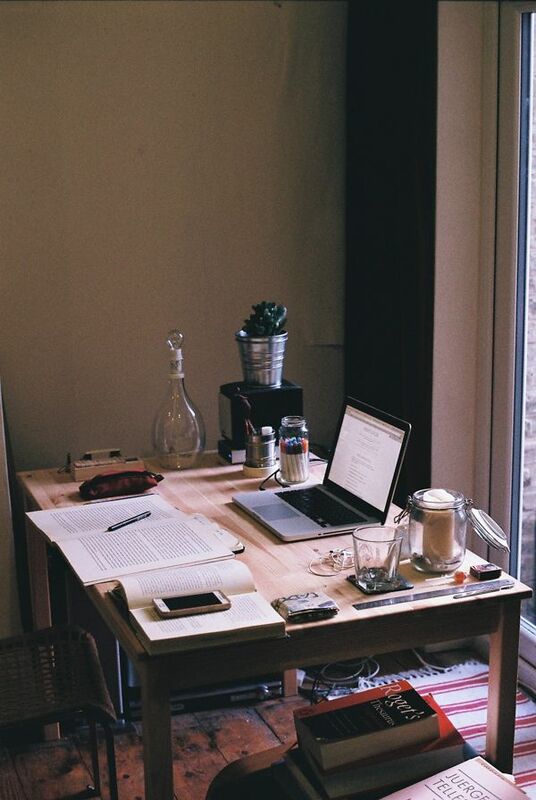 Whatever your writing space looks like, to you it’s the place that conjures inspiration from thin air – a sanctuary where you feel safe and can explore avenues of the written word that you may never have considered before, or be the place where the words tumble out of you like water cascading down a mountain slope. Like any haven worth its merit, your writing space needs to be an equal balance of both order and chaos, where your muse can come out to play in a safe space. Though I’ve yet to photograph my own writing haven, I thought that the very first Writing Wednesday post could showcase others inspirational writing areas; to encourage you to get your own spruced up if need be and to consider adding in items that will remind you of why you love writing in the first place, be it anything from a poster or a feathered pen! All images used above were taken from Pinterest and link back to their Pinterest source – if any of the above images are yours and you’d like them removed, please get in touch and I’ll get it gone asap (no copyright infringement intended). Main image via Pinterest.